No one likes surprises when having any kind of work done in one’s home. It is a disruptive situation no matter what the project. In the case of mold remediation, you are going to have strangers in your home in “other worldly” outfits using serious chemicals. You will feel much less stressed if you know just what the mold remediation company’s MO is. Fix the water problem that caused the mold. Mold remediation is an involved and costly process. You don’t want to have to do it all over again. Clear a path for the crew to move easily from the outside to the mold area and back. For instance, remove cars from the driveway and garage. Keep pets out of the way—in a room with the door closed, in the yard if the crew won’t be working there. The mold remediation company parks the truck as close to the house as possible, lays plastic sheeting down and runs hoses from the doorway to the mold area (unless they can access the mold area from outside of the home, such as in the case of a crawlspace). The mold remediation workers suit up: head-to-toe white suits, booties, respirators and goggles. They do this on every job, toxic mold or non-toxic. They then spray the mold area with an EPA-approved biocide (mold killer). The workers leave while the biocide does its thing. The next day, the mold remediation crew returns, puts down plastic and suits up. 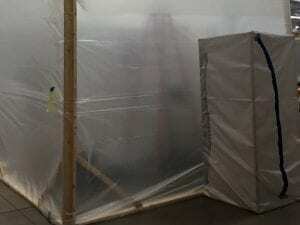 They then spray the mold area with an encapsulant, a type of paint or whitewash that encloses (as if in a capsule) any mold spores that remain. They should spray well beyond the treated area to eliminate any chance of mold growth. For example, the whole attic should be sprayed even if the mold is confined to one spot. Tip: Confirm that the company’s procedure includes this before you sign the contract. Next, the crews cleans the air with an HEPA (High Efficiency Particular Air) air scrubber and an air exchange that replaces moldy air with clean, fresh air. The final step is using an HEPA vacuum to clean the floor or any surface that can be vacuumed to remove stubborn spores that linger. Mold remediation usually includes disposal of moldy porous building materials (drywall, insulation, etc.) and cleaning and disinfecting carpet and personal items if they can be saved. Have a post-remediation inspection done to ensure that the remediation was performed properly. The company that did your initial mold inspection and testing can take care of that.